Chocolate and peanut butter (or almond butter) is one of our favourite combinations, classic. You really can’t go wrong when the two flavours are combined, except when they are loaded with lots of sugar. We encourage all of our clients to reduce their sugar intake and eliminate it if possible, especially if they are going through cancer treatment. Sugar is one of the main causes of inflammation on a cellular level, which makes cells more susceptible to disease, chronic conditions, and cancer. Sugar also leads to an imbalance in the digestive tract because yeast, parasites, and bad bacteria all flourish on sugar. The good bacteria inside the gut helps to prevent an overgrowth of these critters, however sometimes this delicate balance can be thrown off by too much sugar consumption. Not only does this interfere with proper digestion but can lower immunity and reduce absorption of nutrients. And that is why this recipe for Chocolate Almond Butter Cups is wonderful! You can make this recipe with peanut butter, just try to use organic peanut butter as it is healthier and less likely to contain mould than butter made from regular peanuts. This recipe is also rich in protein and healthy fats! This recipe can easily be made in half, if you want fewer cups. 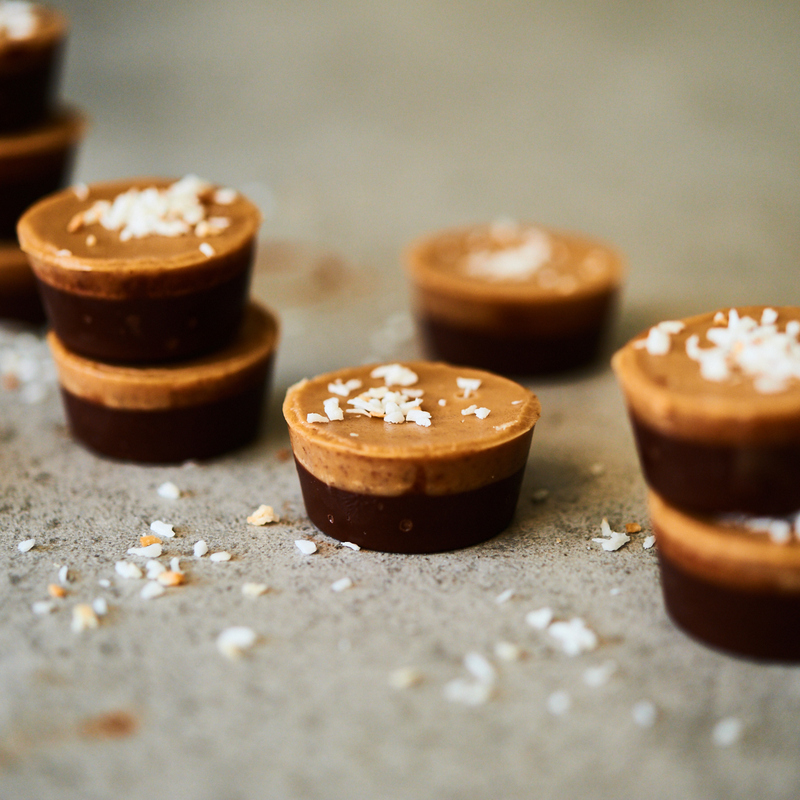 This makes approximately 24 mini chocolate almond butter cups. 1. Make the bottom layer first by lightly heating coconut oil and almond butter in a small saucepan. Stir together until blended. 2. Remove from heat and stir in the cacao powder and stevia. 3. Pour an equal amount into 24 mini muffins (lined with muffin liners or the silicon nonstick mold). 4. Place in freezer for 10-15 minutes, until frozen. 5. Make the top layer by lightly heating coconut oil and almond butter again in a small saucepan. Add a pinch of sea salt. 6. Carefully pour an equal amount over each of the chocolate layers in the muffin tray. 7. Return to freezer until solidified.